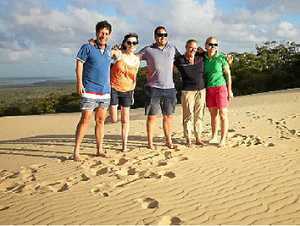 A GROUP of international travel industry representatives visited Rainbow Beach on March 1, as part of an itinerary to showcase the natural values of our region and the range of nature-based tourism products available to visitors. The group included two overseas-based regional directors from Tourism and Events Queensland - Jane Nicholson, UK, Ireland and Nordic regions international director and Kai Ostermann, Europe international director. The TEQ directors were accompanied by Sunshine Coast Destination Ltd's trade and international manager Jan Foletta and head of marketing Laughlin Rigby. Tourism Development manager at Destination Gympie Region, Andrew Saunders was also with the group. The group was investigating new tourism experiences to sell to European wholesalers and travel agents, and to experience first-hand what Australia's Nature Coast offered. They took the adventurous beach route up Teewah Beach from Noosa with stopovers at the coloured sands and Double Island Point. A sunset cruise with John and Maree from Rainbow Beach Houseboats was the perfect introduction to the Great Sandy Strait, with a fresh local seafood platter and informative discussion on the surrounding marine environment, its natural beauty and tourism opportunities. Dinner at the Rainbow Beach Hotel was a relaxing end to the day with more fresh local produce on offer and the guests experiencing the genuine hospitality Rainbow Beach offers to visitors. An overnight stay at Rainbow Ocean Palms Resort was the perfect end to a day of new experiences and adventure. Rainbow Ocean Palms Resort manager Mark Beech said hosting the visitors was a pleasure as all were enthusiastic about what is on offer in our region. "It was also a great opportunity to share details of our new guided walking tours which are designed to help our international guests explore more of the surrounding area during their stay with us," he said. "We guided the group to Carlo sandblow at sunrise and sat perched on the front edge of the blow to watch the first arc of sunlight hit the richness of colour in the sand cliffs below. "While taking in the views to the west from the sandblow, Maree (Rainbow Beach Houseboats) provided some orientation for the group, pointing out where they had sailed on her houseboat the evening before." Fraser Island was next stop on the itinerary, the focus on investigating new opportunities for packaged products in the surrounding region and new nature-based experiences that align with a visit to this must-see destination. Mr Saunders said the positive comments received from the group as they left Rainbow Beach were an endorsement of the natural values the region had to offer and also supported the innovate concept of tourism organisations working co-operatively to present Australia's Nature Coast as a world-class ecotourism destination. "This timing of the visit provides momentum for marketing the region at the upcoming Australia's Nature Coast Roadshow in Sydney and Melbourne in early April. "I will be attending this major marketing event with key tourism operators from the region to promote new nature-based product and network with groups of international travel trade representatives keen to hear about Australia's Nature Coast," Mr Saunders said.